The simple color palette and classic details of this traditional kitchen allow architectural details to shine: white cabinetry with beaded insets, arched valances, crown molding and black accents. 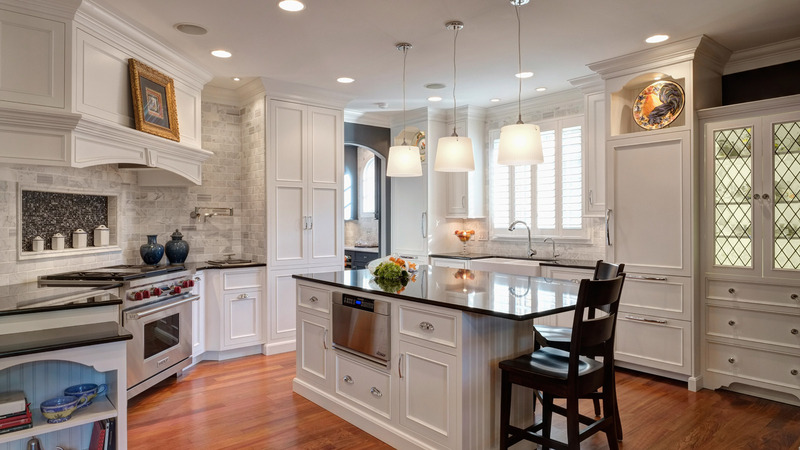 An angled wall with oversized range hood and a recessed niche creates a dramatic focal point. Contrast is found in an adjacent gray dry bar with a painted finish. This design includes a custom-made, leaded glass china cabinet to echo a beautiful leaded-glass window in the home’s foyer. With the interior of the cabinets lit and filled with the homeowner’s lovely china and crystals, the cabinet brings a special shine to the classic design.